At this point in our inaugural American Elm Restoration Awareness Month I am certain you have fallen back in love with the American elm. Maybe you never fell out of love with them. This hearty tree is ideal for urban environments and by planting disease-tolerant American elm cultivars in combination with a number of other tree types we are advancing species diversity, an urban forestry best practice. So what happens once the American elms are in the ground? We do just what we ask you to do when you plant a new tree - properly water and care for it. In addition to our tree planting crew who provides regular tree care to the trees we plant, we hire high school students to serve as Summer Crew members for eight weeks each summer. These dedicated teenagers travel in teams by truck and bike to tree sites all across the District to water, weed and mulch the trees. 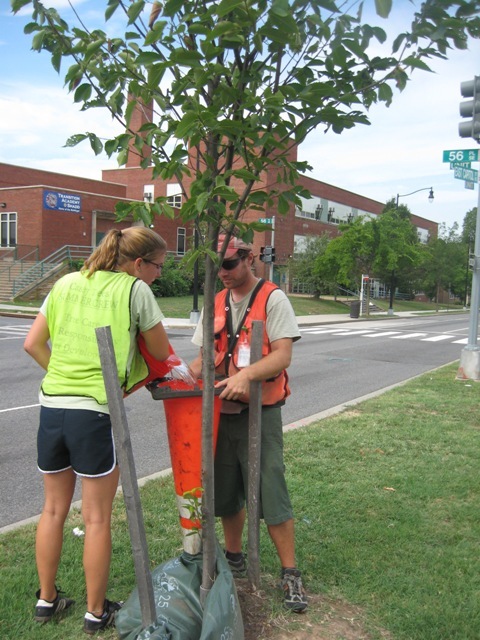 In 2010, Summer Crew members cared for 4,500 trees, far surpassing their goal of 2,500 trees. That is a lot of tree love! Summer Crew members in action. Not only are these students providing much-needed tree care, they are gaining professional development skills and serving as tree ambassadors. While they are watering and weeding, they are answering questions from passerbys. Just the sight of them watering trees prompts drivers and pedestrians to remember to water trees on and surrounding their property. We couldn't be more proud of the work they do. If you know of a student who might be interested in joining the Summer Crew team, encourage them to apply. Applications are due May 1, 2011. Our commitment to our American elms doesn't stop there. We also do structural pruning in years three and four as needed. If you think your trees need to be trimmed, consult Good Tree Care to find a certified arborist. Additionally, we keep residents updated on the work we are doing with American elms near their homes. We have shared our planting schedule with the Councilmembers and ANCs representing areas where American elms are being planted, posted updates on listservs and distributed door hangers in advance of our work. Let us know if there are ways we can improve!